Richard Pitino has a 43-28 record at Minnesota. 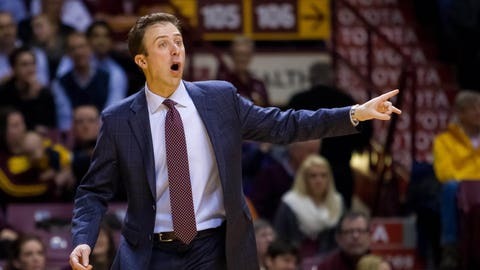 MINNEAPOLIS — Minnesota finalized a two-year contract extension for coach Richard Pitino through the 2020-21 season, including a $400,000 raise. The university released the details Tuesday, months after the terms were agreed to while Norwood Teague was the athletic director. Pitino, who finished his second year as coach of the Gophers, will now make $1.6 million annually. His $500,000 base salary stayed the same; his supplemental compensation was bumped up from $700,000 to $1.1 million. Pitino is still well within in the bottom half of the Big Ten, in terms of money being made by the men’s basketball coaches in the conference. Pitino has a 43-28 record at Minnesota. The Gophers won the NIT in 2014 but missed the postseason altogether in 2015. Pitino also has a "contract fulfillment incentive" of $450,000 if he’s still at Minnesota on April 30. There’s another one scheduled for April 30, 2019. Those incentives were increased by $50,000 from the original deal. If Pitino were to leave his post prior to April 16, the university would be owed $1.5 million. That’s the same language as the initial contract. In the amendment, two additional buyout levels were inserted: $1 million for a departure between May 1 and April 30, 2017, and $750,000 for the period covering May 1, 2017 through April 30, 2018. After that until the expiration of the contract, the amount would be $500,000. Teague resigned this month, following sexual harassment complaints against him. He has been replaced on an interim basis by Beth Goetz. "Being the basketball coach at this tremendous university is something I cherish every day," Pitino said in a statement prepared by the university. "My family and I love living in the Twin Cities and we look forward to continuing to build this basketball program the right way."